The Sanibel-Captiva Conservation Foundation Marine Laboratory is funded through private donations, and local, state, and federal granting agencies. The laboratory currently has six full time staff members, two of which are Ph.D. research scientists. The majority of the research conducted at the laboratory is conducted in collaboration with scientists in academia, local governments, and state agencies. These partners in research include the City of Sanibel, Florida Wildlife Research Institute, Florida Gulf Coast University, Lee County, Mote Marine Laboratory, and the J.N. “Ding” Darling National Wildlife Refuge. SCCF Marine Lab: The current 2,800 sq.ft. laboratory is located on J.N. “Ding” Darling National Wildlife Refuge, in the Tarpon Bay Recreation Area. The facility is ‘on the bay’ and less than a 1.5 miles from SCCF’s Nature Center. The SCCF Marine Laboratory is a member of the National Association of Marine Laboratories (NAML and SAML, Southern Association of Marine Laboratories), a nonprofit organization of over 120 labs who provide diverse educational and research experiences. The SCCF Marine Lab is also a member of the Organization of Biological Field Stations (OBFS) since 2003. The Lab joined the Florida Institute of Oceanography (FIO) in 2012 and is a member of the FIO Advisory Council, made up of individuals from the Florida State University System and other Florida marine centers. Research currently conducted by our scientists includes: (1) understanding of the function and restoration of marine, estuarine and near freshwater habitats (2) determining the effects of human activities including regulated freshwater discharges on these habitats (3) characterizing nearshore water quality and (4) improving the condition of barrier island lakes and the Sanibel River Slough. All research conducted at the lab is enhanced by the River Estuary Coastal Observing Network (RECON), an instrument array composed of eight near real-time sensors deployed throughout the Caloosahatchee Estuary and Pine Island Sound. Research at the laboratory is often driven by critical management questions concerning water quality, estuary health, and the restoration of these resources. With our research partners, the scientific investigation of the J.N. “Ding” Darling National Wildlife Refuge complex and the status of the urbanized Caloosahatchee Estuary is the basis of environmental policy recommendations and fact-based advocacy. 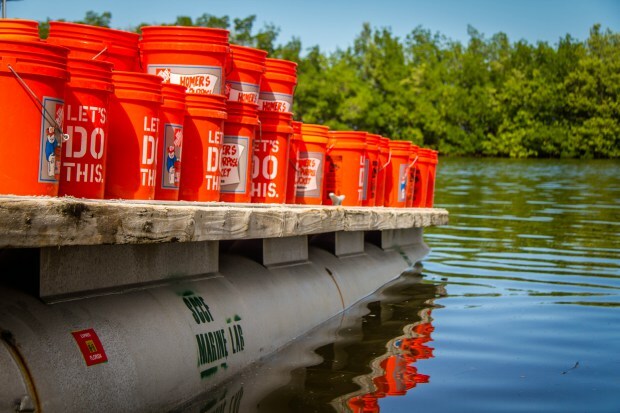 Data collected by the Marine Laboratory is also used to better understand the current state of the waters and marine life surrounding Sanibel and Captiva and to make informed decisions about future of the estuary.